Free Shipping Included! Messermeister-Made in Germany-Meridian Elite Kullens Carving Set, 2-Piece by Messermeister at Just Gathering. MPN: 559879-E/3000-2KS. Hurry! Limited time offer. Offer valid only while supplies last. 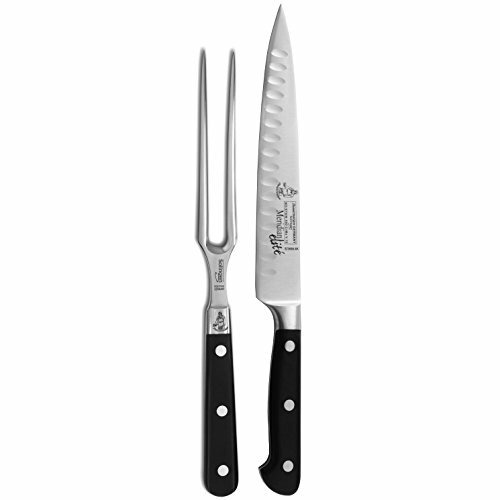 The Messermeister Meridian Elité Carving Set consists of an 8'' Kullenschliff Carving Knife (E/3688-8K) and a 6'' Straight Carving Fork (E/3805-6). The Messermeister Meridian Elité Carving Set consists of an 8" Kullenschliff Carving Knife (E/3688-8K) and a 6" Straight Carving Fork (E/3805-6). This set is the perfect addition to your cutlery collection.